It has been over a year since I last posted a cake recipe. To make up for that, today's recipe is a doozy! 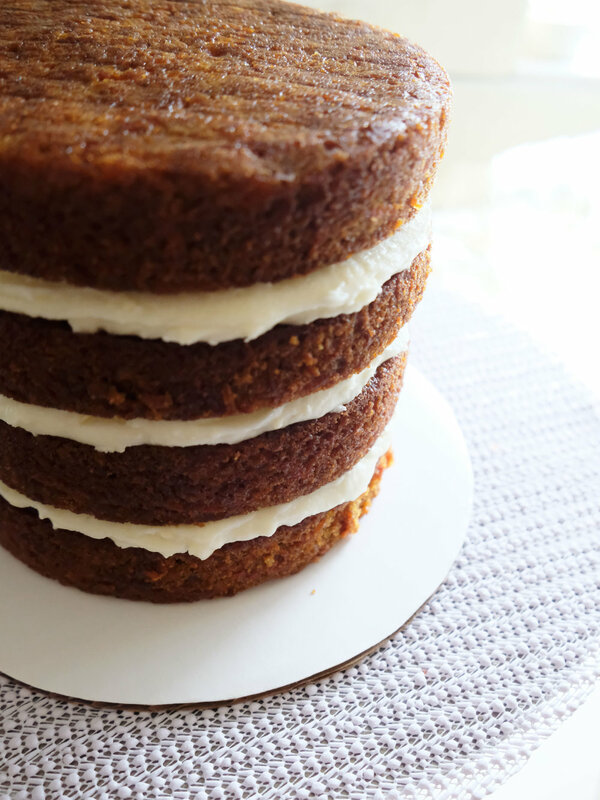 After much delay I am finally posting my recipe for Graham Cracker Carrot Cake! I have made a version of this cake for two weddings (two more later this year) and it is always a hit. I made this cake for the first time in 2015 for the wedding of my friends Alexa and Evan. They were getting married outside of Palo Alto, California so this cake involved a plane ride and making the cake in an AirBNB. This was also my first wedding cake and though I might've been slightly over my head, I agreed to do it. I'm always up for a challenge! Two days before the wedding, I filled a carry on suitcase with spices in paper pouches, cake pans, and spatulas and went to airport. Of course, I was promptly searched because my bag must've looked like a drug mule on the x-ray machine. The TSA agent had a laugh about it when I explained I was traveling to California to make a wedding cake and after swabbing my bag for drugs he wished me luck and sent me on my way. In hindsight, baking a wedding cake in a foreign kitchen is not what I recommend. My oven at home is nothing fancy, but I know its quirks. We have a good working relationship. Searching for decent ovens in AirBNBs and asking rather detailed questions about the contents of someone's kitchen seems a tad strange for the person renting out their home. After a day of baking, another day of assembling, and a rather anxious and anxiety filled car ride to the wedding venue, I set up the cake and it was a smash! I think at the end of the night there were two slices of cake left which were promptly eaten the next morning while we cleaned up. Since that first wedding, I have made a version of this cake for another wedding and countless birthday parties and dinners (including last night - Happy Birthday Ricky!). Bottomline, this cake is always a hit. This recipe is based on a recipe from Smitten Kitchen. Lately I've been a fan of smaller cakes and wanted something with a bit more height and thickness per layer, so these changes reflect that. As much as I bake, cakes tend to last a while in my refrigerator. My small family usually can't finish a typical eight inch cake. Enter the six inch pan. Like San Francisco favorite bakery Miette, I love the look of six inch cakes. Not only do they frost beautifully, but the proportions and serving amounts are just right for a small family. I think as I grow older, I tend less towards overly sweet things and more towards desserts with more tartness and bite. However, when one thinks of carrot cake and cream cheese frosting, they often conjure up visions of sweet powdered sugar cream cheese frosting. This cake however doesn't use the standard cream cheese frosting. Instead, this cake uses a boiled frosting. Boiled frosting is made of a base of thickened flour roux and sugar instead of powdered sugar. This results in a less sickly sweet frosting that lets the tang of the cream cheese shine. Yes, it takes a little more effort, but I promise it's worth it. Win win in my book! Begin cream cheese frosting: whisk together sugar, cornstarch, flour and salt in a medium saucepan. Pour in milk and cook over medium heat stirring continuously with a wooden spoon until mixture boils and becomes a thick pudding consistency, about five minutes. Place cooked flour mixture into a heat proof bowl. Place plastic wrap on top of mixture and chill in refrigerator until cool, two to three hours. This mixture can be made ahead a day or two and refrigerated. Make cake: Line two 6-inch cake pans with parchment and spray with a nonstick cooking spray. The cake will be baked in two batches. Preheat oven to 350°. In a large bowl, whisk together flour, graham cracker crumbs, baking soda, baking powder, salt, cinnamon, nutmeg, clove, and ginger. Using same whisk, mix granulated and brown sugar, eggs and vegetable oil until smooth. Pour oil mixture into dry ingredients and stir in shredded carrots. Mix until no flour remains. Measure 1 1/2 cup batter into each prepared baking pan. Bake each layer for 28 to 32 minutes until a tester comes out clean. Top of cake will appear slightly tacky. Let cake rest on a wire rack for five minutes. Run a knife around the edge of the pan and flip cake onto rack. Remove parchment paper and flip cake right side up onto another rack to to cool completely. Wash and dry pans and wipe parchment paper with paper towel to remove any stuck on crumbs. Place parchment into pan again and spray with non-stick spray. Divide remaining batter between two pans and repeat baking instructions above. Cool cakes completely before filling. Finish cream cheese frosting: place soft butter and vanilla extract into bowl of a stand mixer and beat on medium for a few minutes until very fluffy and lightened. Place chilled flour mixture into mixer and beat until combined on medium speed for one more minute. With mixer running at low, drop in cream cheese one tablespoon at a time. Beat mixture until all ingredients are incorporated and frosting is smooth and thick. Recipe will make around 4 cups of frosting. Arrange cake on cardboard round and spread 1/2 cup frosting on cake layer. Stack next layer and repeat with remaining layers. Decorate cake as you want! Frosting is enough to frost entire cake or make a naked cake with piped borders and decorations.